Elizabeth was starting to get a little bored with the life of resting flat on the floor on her quilt. So yesterday I decided to gave her a little support and whipped up my version of a boppy for her. It’s made from some fabric I’ve been hoarding for probably more than a year now and the under side used up that last big piece of some brown and white seersucker. It’s nice because it props her up a little bit so that she can see all the action going on around her and it helps control those flailing baby arms. I also added loops on the sides in case I ever want to hang it up and out of the way on the back of her door, or if I want to add a few links of toys for her when she gets a little older. 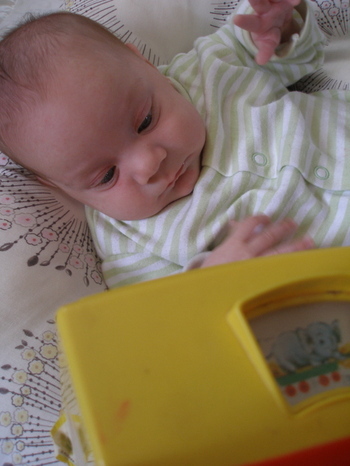 And it’s also good for viewing her favorite music box toy–which at this moment I’m realizing is basically baby TV….hmm. not sure how I feel about that. I was wondering if the mmm bop was Hanson and it was! Isn’t Elizabeth a cutie? Oh Hanson. Tho’ sweet baby photos are better than blond brother boy bands. By the way those hydrangeas still take my breath away, especially after leaving a comment at the verification page. It pops right out at you! 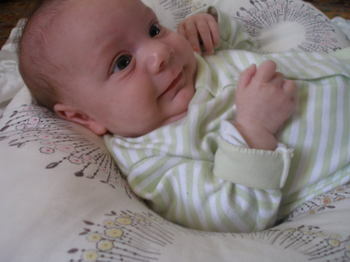 Wow, you did a great job with your handmade Boppy! Elizabeth looks very cozy and happy! I’m sure she loves her new ‘view of the world”! Babies love the loops. You know they make those tag blankies now. I can;t believe how big she is already! Love the ribbon loops. Great idea. I love that fabric!! I have always kicked myself for not buying yards of it. Once I realized that having a nice stash would be worthwhile, it was all gone! what a great idea to make your own boppy. 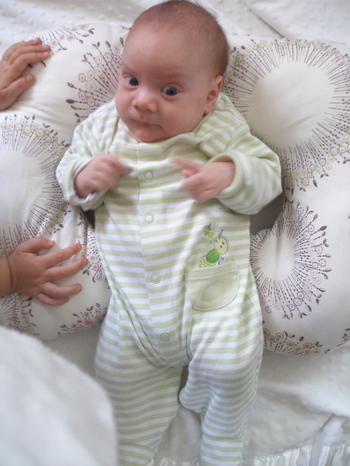 love that boppy and the fabric! wow! elizabeth is getting so big – what a cutie! baby tv! ha. love that fabric, and that little sweet girl. we have those pjs! they made it through three kids.. Nursing Pillows are the BEST! Clever crafting!Elizabeth looks mighty pleased! I really think Elizabeth is gorgeous! Give her a big hug from me! I always loved those soft pyjama’s ‘in one piece’, it makes me want to hug baby’s even more!I also LOVE your new banner! 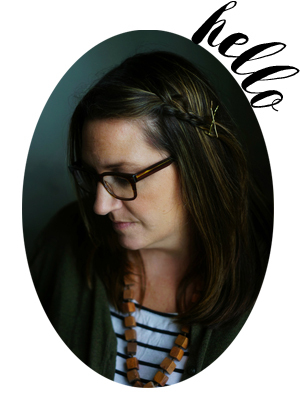 It’s so pure and stylish, just as your whole blog! 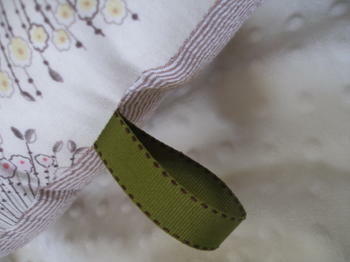 Love the boppy fabric, and the ribbon loops. Great idea! she is just YUMMY! I love the little hands. And that face! The pillow is gorgeous too. I am hoarding that same fabric! Oh, thank you for sharing the Hanson lyrics. that was just too much. 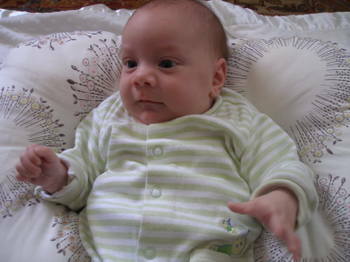 What are the rough dimensions of the Boppy? I know a bunch of babies who would appreciate this as much as your sweety does. Okay, looking at your scottish post and talking about music – I read this mmmm bop thing on Friday and over the weekend I heard the song on NPR closing out some segment – I don’t even know why they were playing it. Whatever. I’m standing in the kitchen with my family all around me, listening to the radio, loading the dishwasher. That song came on and I all but lost it. I don’t think I’d ever really thought about those lyrics before, but Molly, I had to take a deep breath and not look at anyone for a moment or I would burst out full-on crying. It was all good. I felt greatful and foolish all at the same time. So I just thought I’d share that with you and say thanks for giving me something to think about, as you often do.Cheers!And P.S. Miss Elizabeth is adorable.